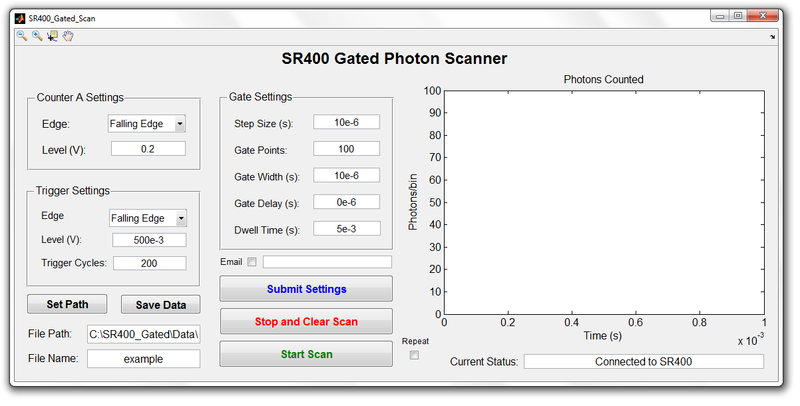 This MATLAB software allows you to record data from a Stanford Research Systems SR400 Photon Counter. The user can remotely set the counter edge, counter level, trigger edge, trigger level, number of trigger cycles, and a variety of gate parameters. Completed scans are plotted in the figure window and data can be saved to a .txt containing the scan settings followed by a list of time bins and their corresponding photon counts.